When you double-click on a file name on your PC's desktop or in Windows Explorer, a specific application opens to handle that file. For example when you double-click on an MP3 file, Windows Media Player opens to play the music file. When you open a DOC file, Microsoft Word opens to display the document file. These are the default programs for these file types. The default programs for your PC my be configured differently. Windows determines which application to open for each specific file by its "file association". A file association is a relationship between a files "file extension" and an application. A file extension is the characters (usually 3 characters) after the last dot in the file name. Unfortunately, Windows is configured by default to hide the file extensions. If you even want to understand how the Windows file system works, you need to unhide file extensions. 1. In Control Panel's Appearance and Personalization group, click on Folder Options. 2. In the Folder Options dialog box that appears, select the View tab. 3. On the View tab, in the Advanced Settings list, uncheck the checkbox next to Hide extensions for known file types. 4. Click on the [OK] button. You should now be able to see the file extensions in file names on the desktop and in Windows Explorer. 1. In Control Panel click on the Programs link. 2. 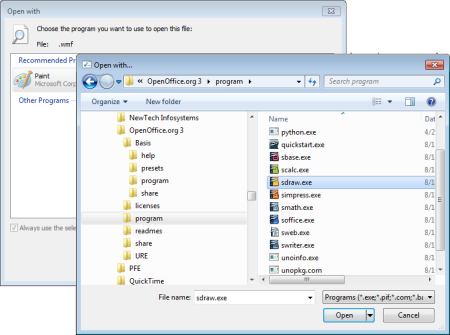 On the Programs page, under Default Programs, click on the Make a file type always open in a specific program. 3. When the Associate a file type or protocol with a specific program page opens, click on a file extension in the list, then click on the [Change program...] button. 4. In the Open with dialog box that appears, select one of the listed programs or click on the [Browse...] button. If you click on the [Browse..] button, you'll need to search for the applications executable with another Open with dialog box that appears. Most application executables will be located in a subfolder of the c:\Program Files (x86) folder. After you select the name of the executable, click on the [Open] button and the executable's file name will appear in the first Open with dialog box. 5. In the Open with dialog box click on the [OK] button. On the Associate a file type or protocol with a specific program page, click on the [Close] button. Now, when you double-click on a file with that file extension, it will open in your chosen Application.